Why is a geometric progression called so? Just curious about why geometric progression is called so. Is it related to geometry? Here's an extremely nice picture illustrating the geometric series and making it geometrically clear how it converges when $x<1$. $s-1=xs$ follows from $PN/ON=BA/OA$ which follows from the fact that $\triangle OAB$ is similar to $\triangle ONP$. 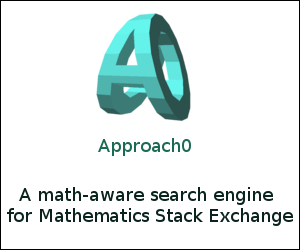 My guess would be that geometric sequences arose as generalization of sequence $a,a^2,a^3,...$. Why is this geometric? Well, $a$ is the length (= 1-dimensional "volume") of line segment (= 1-dimensional hypercube) of "side" length $a$, $a^2$ is the area (= 2-dimensional "volume") of a square (= 2-dimensional hypercube) of side length $a$, $a^3$ is the volume (= 3-dimensional "volume") of a cube (= 3-dimensional hypercube) of side length $a$ and so on. The arithmetic and geometric adjectives come from the Pythagoreans before the Christian Era. 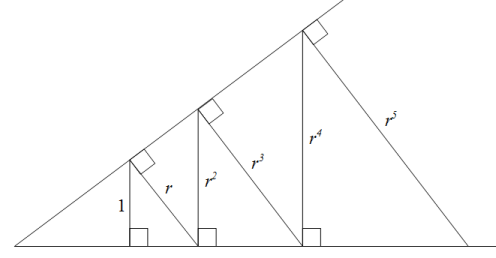 Apparently, the expression “geometric progression” comes from the “geometric mean” (Euclidean notion) of segments of length $a$ and $b$: it is the length of the side $c$ of a square whose area is equal to the area of the rectangle of sides $a$ and $b$. 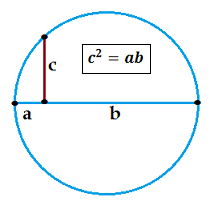 The construction of the geometric mean with ruler and compass is well known for high school students; it involves "multiplication" and not "addition". Because geometric progressions are based on multiplication, and the most important geometric notion, namely, volume, arises from multiplication (length times width times height). The term “multiplicative” is not used because it already has a special meaning in Number Theory. Not the answer you're looking for? Browse other questions tagged sequences-and-series terminology geometric-progressions or ask your own question. What about the 'geometry' in 'geometric progression'? In what sense is a geometric series geometric? Is there a name for the sum of increasing powers? Arithmetic and geometric sequences: where does their name come from? How is this series in geometric progression?